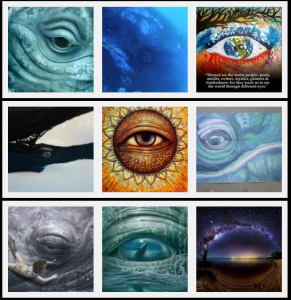 We began this journey with our website Whale Communicators and in late 2012 and early 2013 my life was turned inside out and upside down with satanics, demonics and black magic. I would come for find that Mary Getten and Anne Gordon along with many other players on my team were behind these dark attack which killed my cat and almost killed me that year. Thus Heart Communicators was born to talk about this BS in our world and the people who engage it. 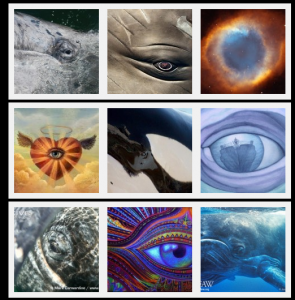 Be sure to check out Whale Communicators. This is the girl (orca pictured below) that I began my journey into mental telepathy with in 2010. My whole world changed once I met Granny and began communicating with her daily. It began back in 2009 after I had lost 7 people I loved in a 14 month period to death. I believe my grief gave me permission to stop and smell the roses as I was grieving incredibly. Life changed forever for me once she began to fill me in on my history and the true history of our world. Her name is Granny (pictured below) and she is the matriarch of J Pod of the Resident Orcas who summer in Puget Sound in Washington state. I work with her daily doing land and water blessings for our Earth and our Universe for over 4 years now full time. She is amazing and has so much information to share with anyone who connects with her. She has wisdom for each of us . . . she is one of many keepers of the akashic records. Action ACTION action Click on graphic to enlarge. Communicate directly with her or learn how to in our elearning DVD. Or make an appointment with me and let’s start this whole process with a healing directly with God, an akashic clearing. And then learn the skill set of mental telepathy and then write your own ticket to salvation on our Planet. The time is now people! See the video attached to the above picture; a whaley incredible video clip given to us by Schoko Katzh. Click here to watch video. Only you can save yourself at this time. You cannot save the world. You cannot save the world without clearing out your internal planet first. By doing this, you allow all other pathways out into the Universe to clear and reset themsleves. When you do this work on yourself or do healing work with our Planet , , , with our Mother Earth, you in deed are doing the most Godly work on our Planet at this time. Click here for some wonderful videos of the whales and dolphins that I posted on our Whale Communicators web page. 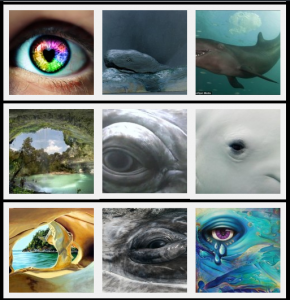 Click here for some great conversations with the whales and dolphins. This is truly about the magic upon the web of life. Stop this video in a few spots. You can follow the magic of the sacred geometry (healing) energies emanating from this pilot whale to these 2 men. Often times this energy is hitting them in their heads when you freeze the video frames. This video just gives me goose bumps in the best way possible. This is about love, this is about healing being who have killed your kind for centuries. This is about a love that his shared freely and heals so deeply. This is how to do it Pod Mates. It takes a pilot whale to give many of us this lesson. “Thank you for giving me this venue to speak with humans who are seeking a better way. Seeking is part of coming alive and so the seed is stirring . . . now there are so many things you can do to continue this nurturing and growth of your Spirit. Not the Spirit of the man-made religions of Planet Earth but the Spirit that houses your connection to the Divine and ALL that IS (seeing the Web of Life and all the connections). We are your brothers and sisters in time and space. Many don’t recognize this yet within yourselves. We LOVE you and we want to help you move to the next level. Please come to us and communicate with us. Hear from us the answers to the things that angst your heart or that help you house your JOY. Let us assist you to be the true essence of who you were meant to be energetically on this Planet. We have only your best and Divine interest in mind. We won’t help unless asked but will gladly assist you in healing, renewing, communicating, spreading messages to the world. But you have to ask us, please remember this. “I had a friend ask me on Friday, “What are you going to do this weekend to really love yourself?” What an excellent question I told her – I love this question and will be asking this much more of myself in the future. It sure got me motivated to do some extraordinary things for myself both Saturday and Sunday :o). And I tell you this cutting back on FB – what a wonderful thing this has been. I told her I was going to get out in nature for over 3 hours – just me and the forest. It was at about the 2 hour and 45 minute mark that I found this obscure trail deeper into the woods. It wasn’t well traveled. As I sat in this one particular spot I began to commune with God and the benevolent spirits of this forest and the Whales (the cetaceans love to visit in the forest). I asked this question of the land ambassador/guardian of this particular forest to join us and I asked, “What do you think about people just pulling up plants and killing them in order to make new trails in your forest”? Her response was, “As long as it is repurposed for the growth of other plants, we are okay with this”. And in pops Granny, who is my constant companion on my walks. She is an Orca I work with daily doing land and water blessings. 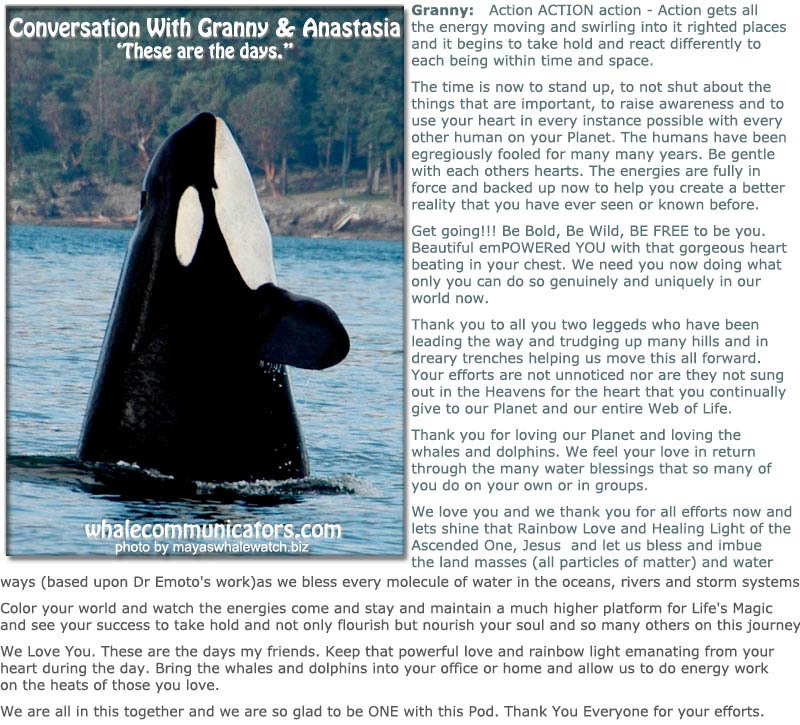 She still lives in body in Puget sound and matriarch of a large pod dubbed J Pod by researchers up there. 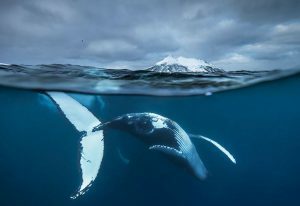 Granny said to me, “It is just like killing a whale, if it repurposes a human heart we are good with this”. 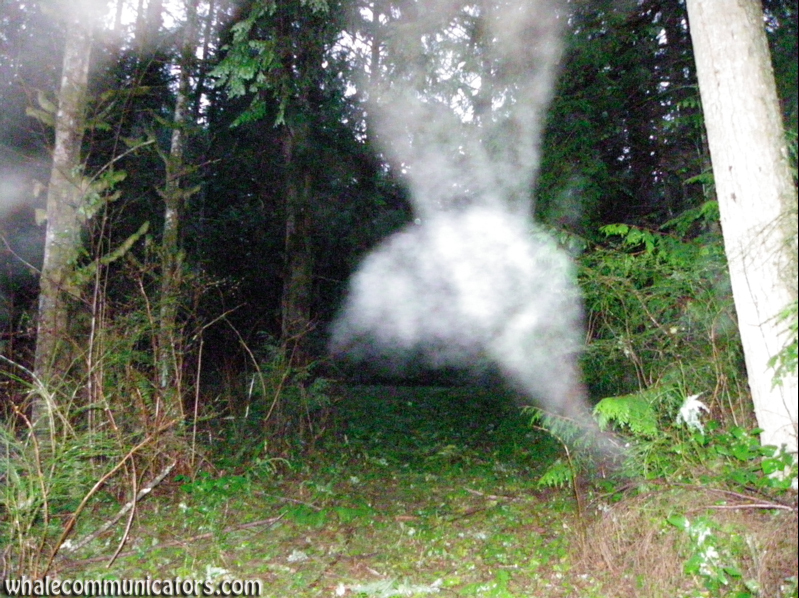 Granny appearing for me in a mist of orbs in a forest in Monroe, WA in 2011. The chevron going up the middle was mind blowing. I was doubting a lot of the communications and messages I was getting those first few years due to fully resolved issues within me that had not been completely healed from childhood.. She would appear for me in a couple of profound instances that just blew me away and helped me heal my troubled heart so I could learn to truly love again. When we doubt what we are getting with a mental telepathy connection, it is the equivalent of hanging up the phone. You dissconnect the energy with your doubts. If you just stay in a neutral place of just BEing and you open to new things. Your imagination can kick start this for you in this lifetime and life as you know it will never be the same. You will be opening a door to your own brilliance and have the opportunity to share your unique vibration and BEing with our world. We need all humans in this place now upon our Earth. And let’s change our world from the inside out. Be sure to check out our website specifically bringing the messages of the whales and dolphins to the human race. Brilliant Beautiful BEings. 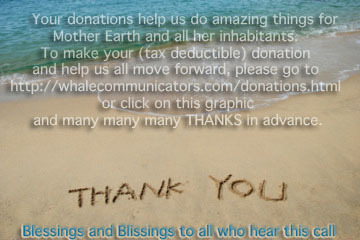 Click on the graphic below to be redirected to Whale Communicators website.